Ele and I exchanged gifts this month with the theme, "The Twelve Days of Christmas". 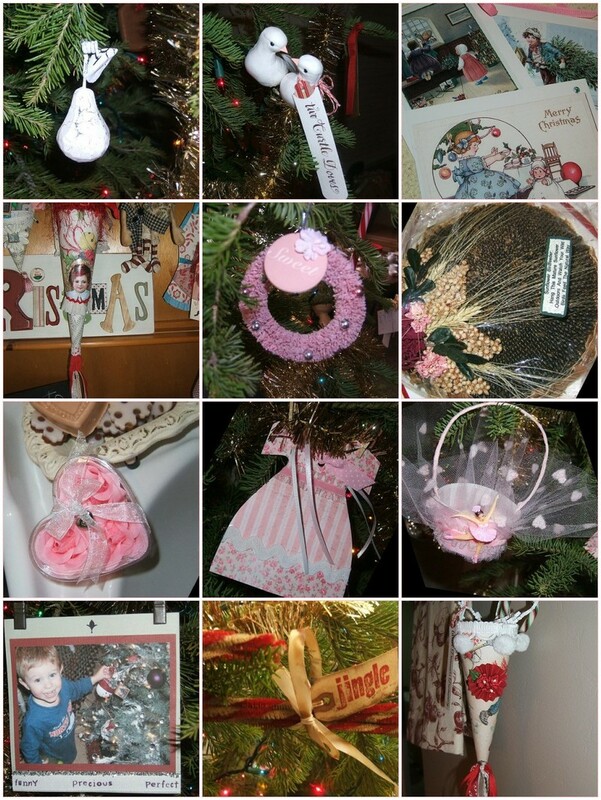 Monica over at Home is Where Your Heart is, hosted a lovely little Christmas Ornament Swap. 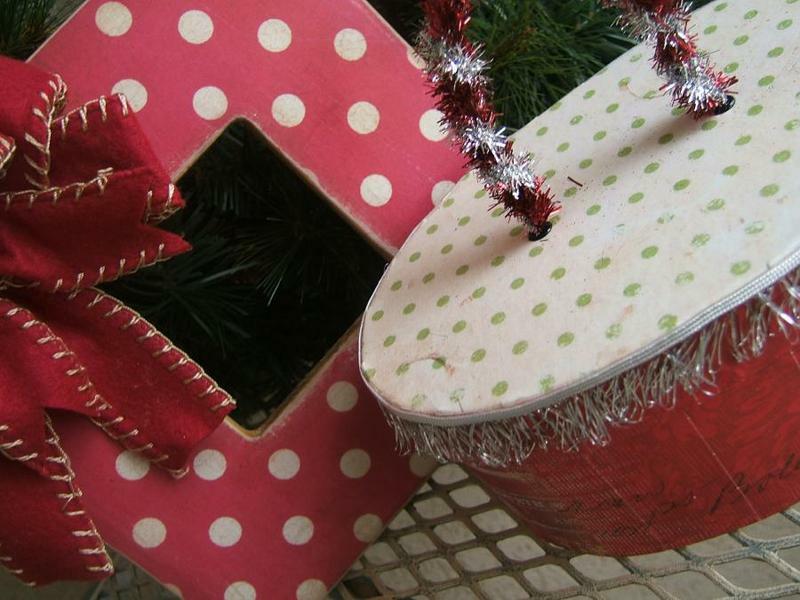 I made Laura a whimsical paper covered box, complete with tinsel trim and a cute little handle. It is filled with three little ornaments. 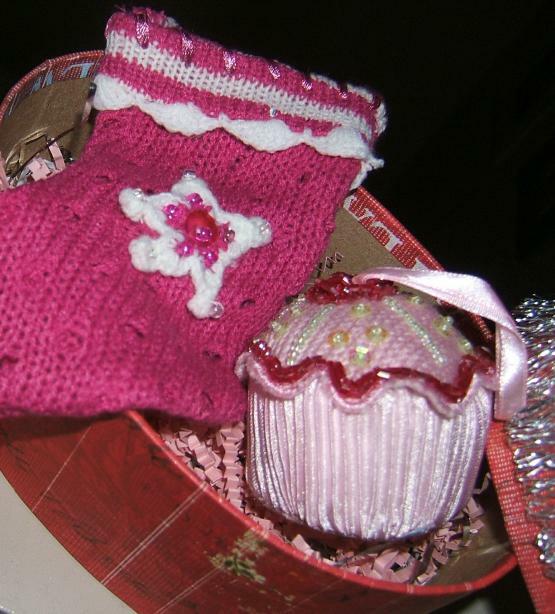 A pink stocking, helicopter and cupcake. Found these beauties at Target, Ele and I had a discussion about this store...and we love Target!! Laura said she has a lot of red in her home and puts a tree in every room! I love this!! 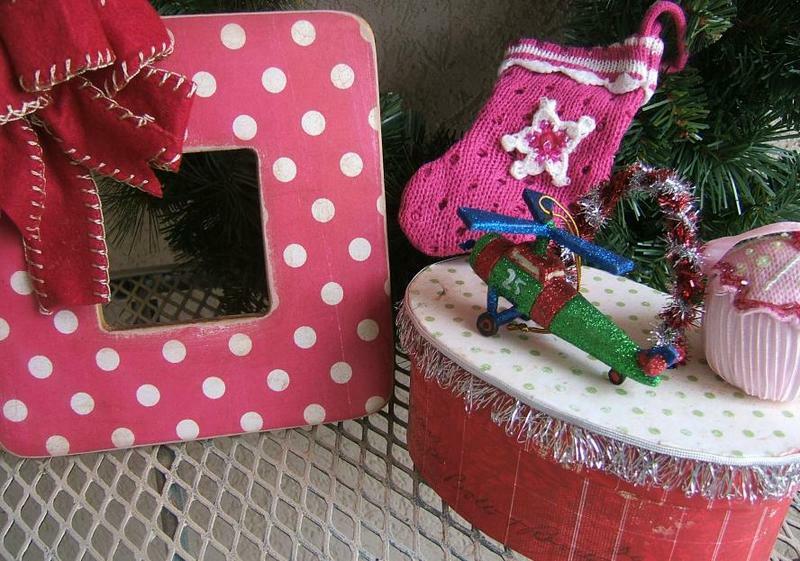 She loves cupcakes, the helicopter ornament if for her son and pink stocking for her daughter. 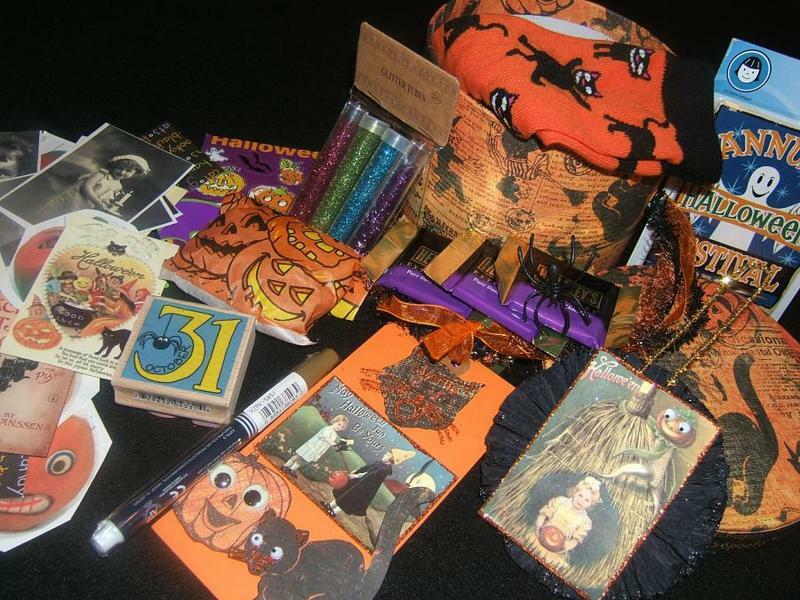 Thank you Debra of Hop Hop Jingle Boo, for these amazing gifts. 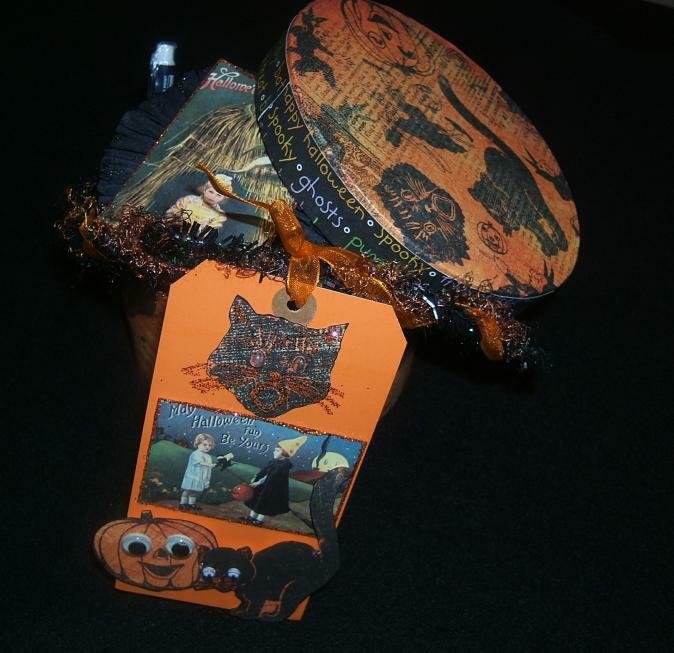 The trick or treat container is a paper art beauty and it's my favorite! 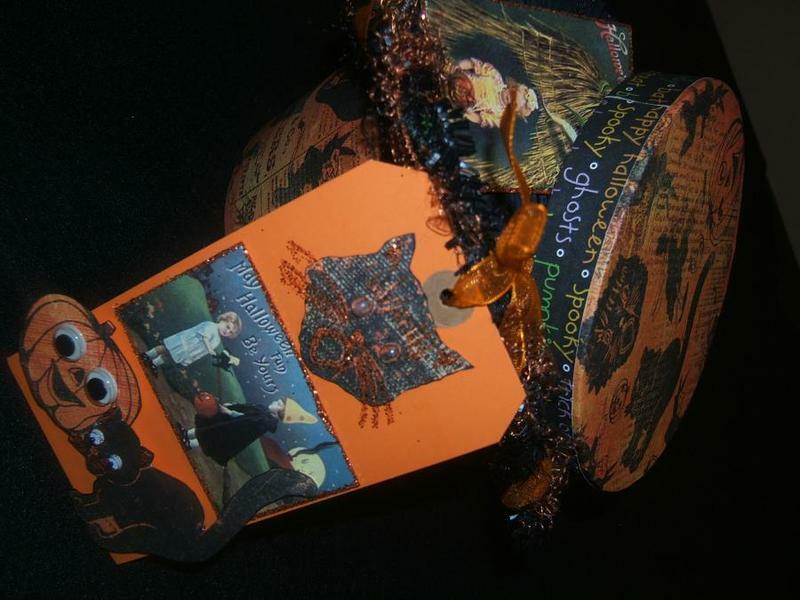 I dearly love the tags that Debra made and all of the goodies inside. 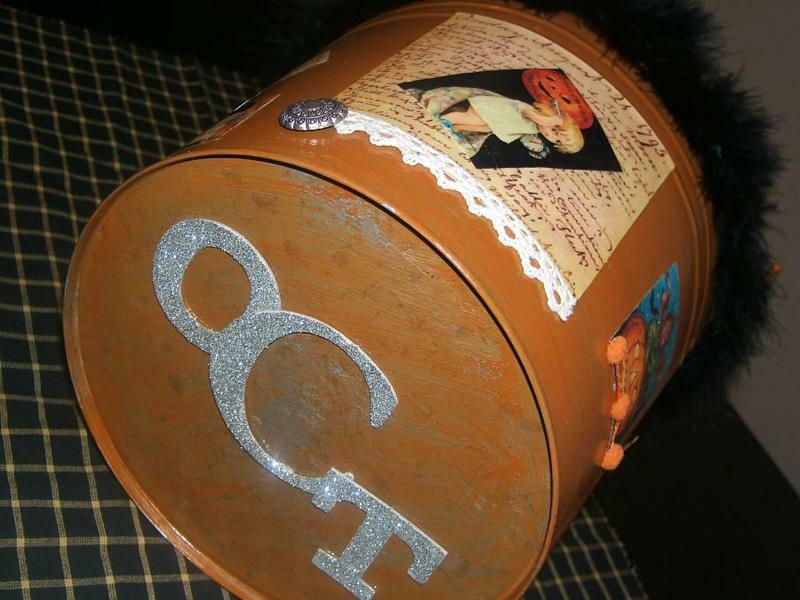 Debra filled my container with Halloween socks, vintage pictures, artful tags, glitter, candy, art pen, rubber Halloween stamp, wooden Halloween sign and a delightful Halloween ornie. 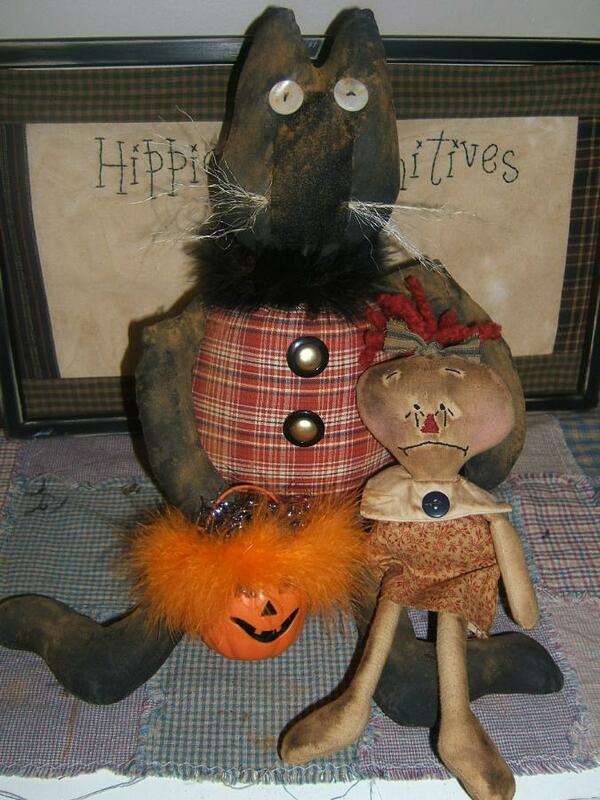 If you are still feeling Spooky----Please check out my Etsy Shop for one last Halloween item I am adding. It's my last Halloween goodie of the season. Happy Halloween! 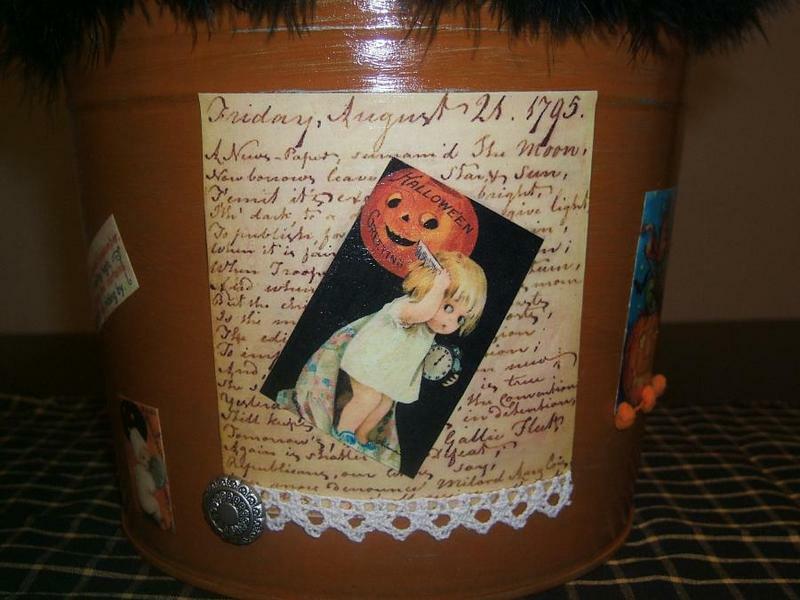 Had a great time with Amy's Trick or Treat Swap over at Crafting by Candlelight. 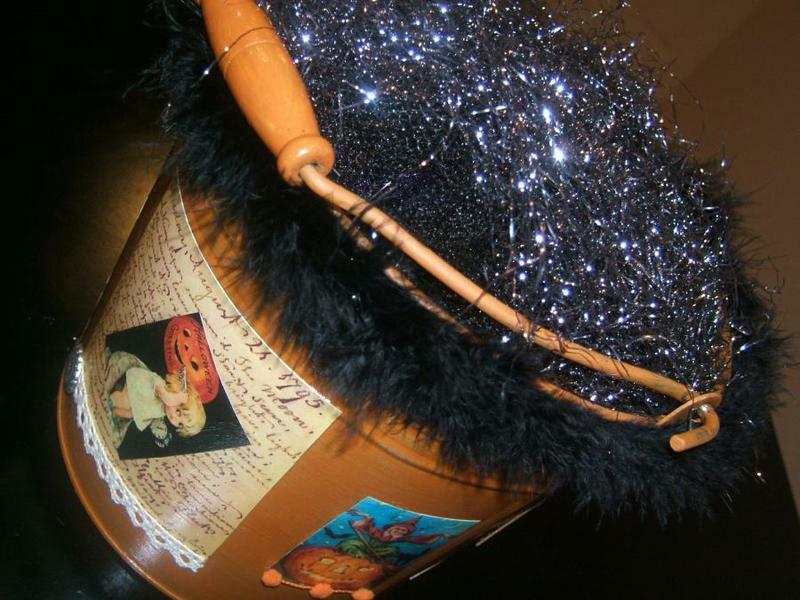 I used an old bucket to add some magic. 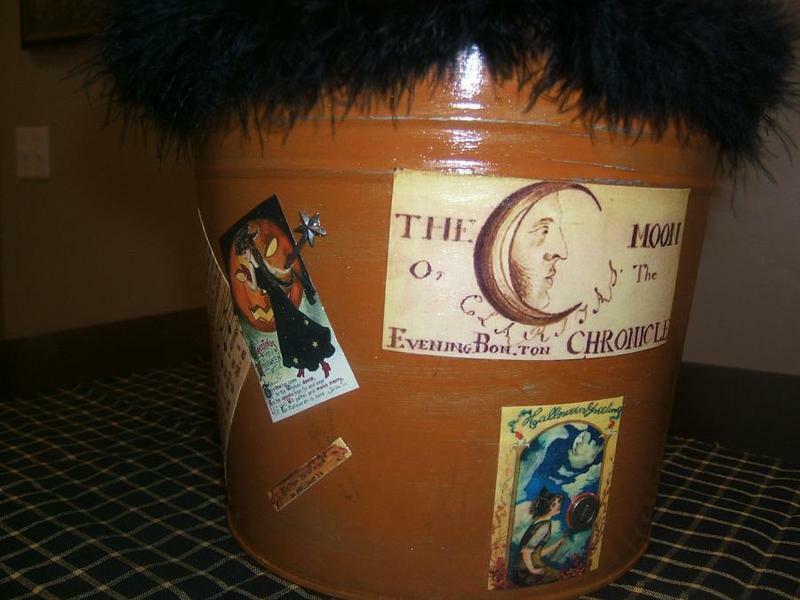 Mixed a splendid Witches Brew of paints to get the color just right. Sanded with an Old Toad and added stain from an Old Rusty Oil Can. Found some Hallow's Eve Prints and Sealed them with a Witches Kiss. 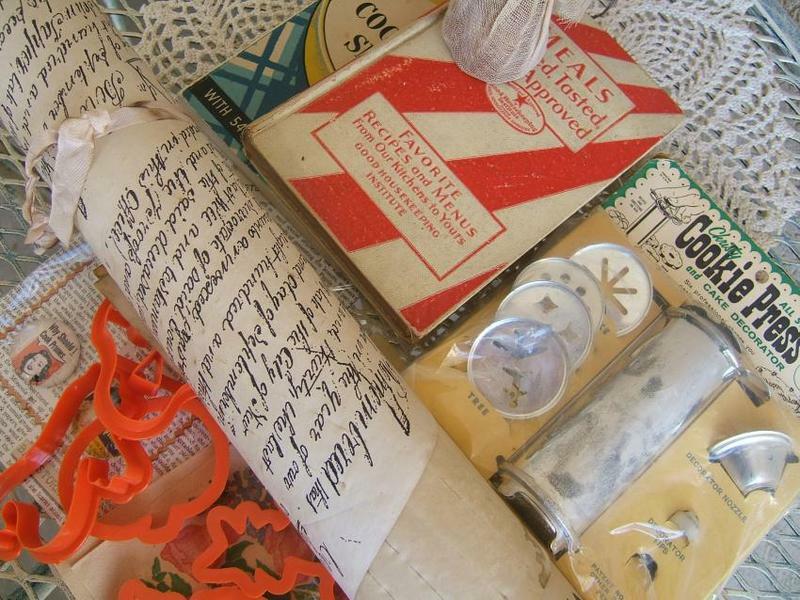 I borrowed some items from an Old Witch to use for embellishing. 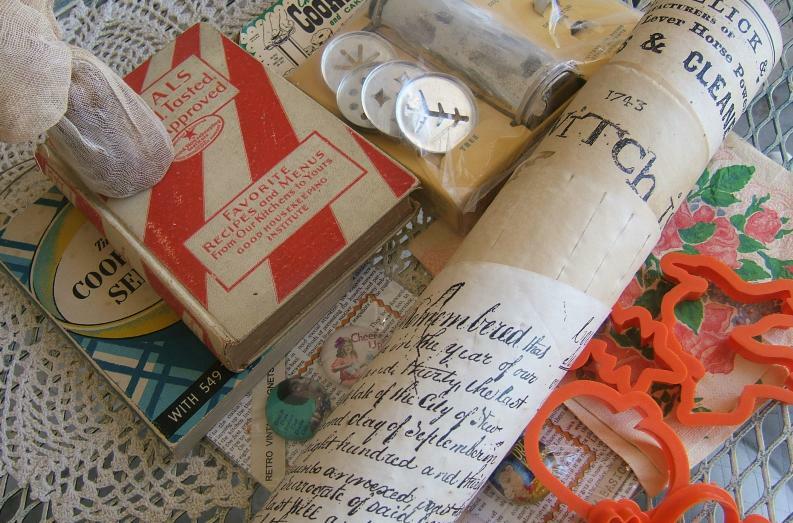 Buttons, keys, lace, trims and a bucket full of Witches Hair. Debra, of HopHopJingleBoo, loves chocolate and nuts, so here you are my pretty! Chocolate galore! Enjoy and enjoy! 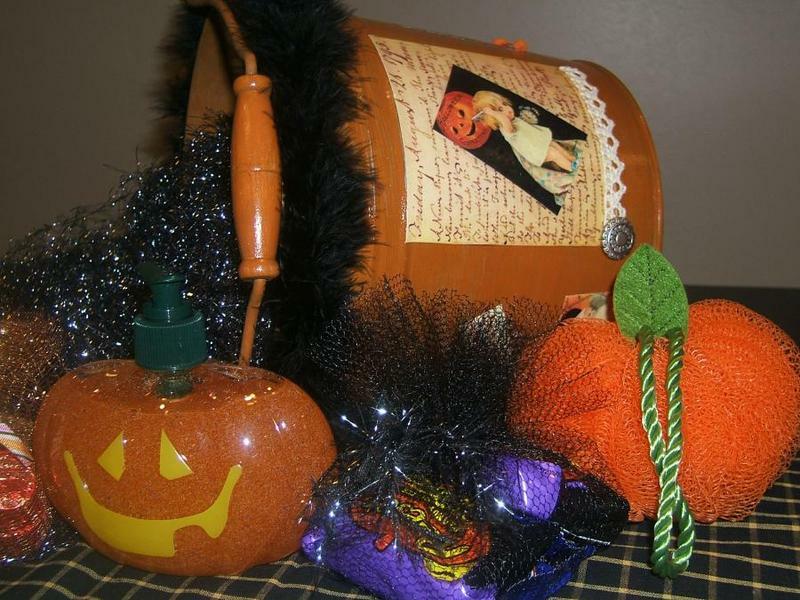 I also included some Pumpkin Soap and a Pumpkin Sponge from Bath and Body Works for a bit of fun. Happy Halloween! 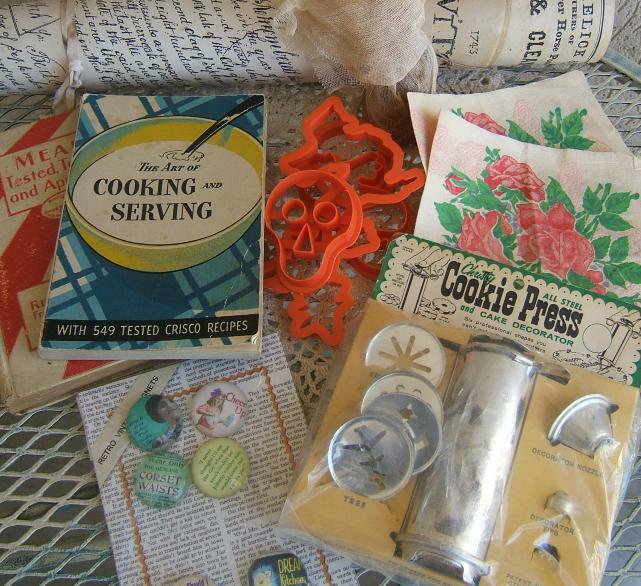 Stephanie, of Samplers Country, sent me some wonderful items for our Kitchen Swap!! I'm in total love with all of it! I can't pick a favorite because I'm just goose-bumpy over all of it!! She knows that I love Netty LaCroix designs, so she sent me some Netty LaCroix papers....you can't see them all....but they are all different and amazing!! 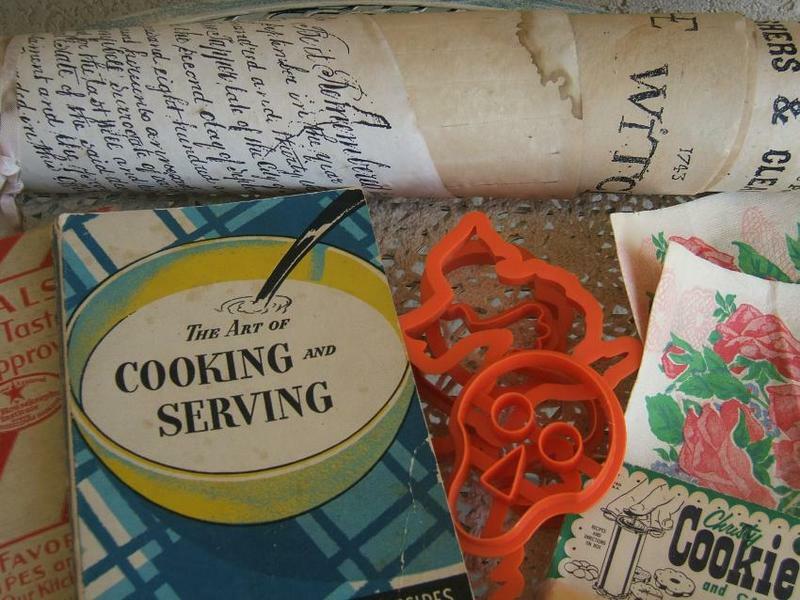 Stephanie is an avid vintage cookbook collector......look at these two wonderful cookbooks she sent!! They are amazing!! 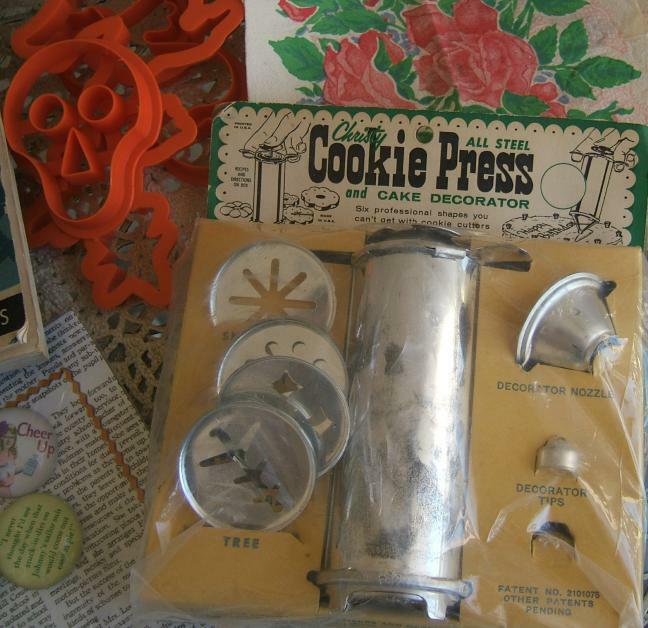 Don't you just love this cookie press? 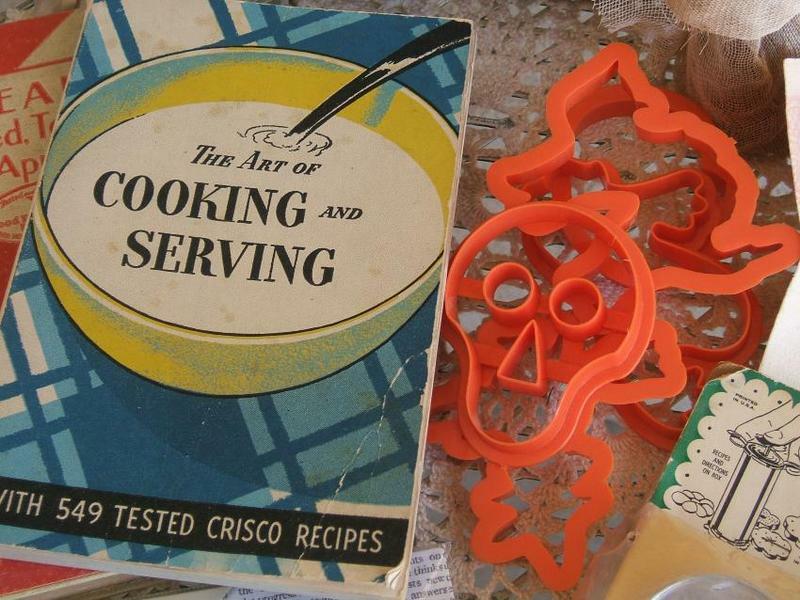 You gotta love those Halloween cookie cutters!! 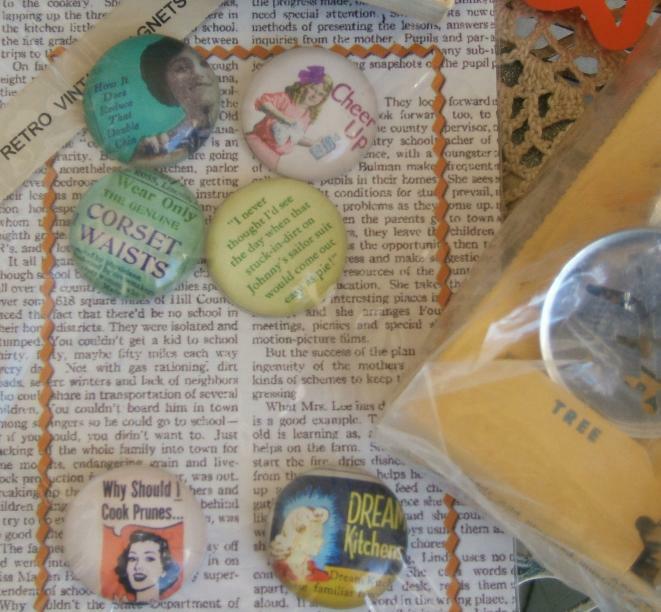 Check out these retro magnets!! What a scream!! So many yummy items!!! Stephanie collects magnets and picked both of us up a pair near her beach house in Michigan.